Vertex Groups are mainly used to tag the vertices belonging to parts of a Mesh Object or Lattice. Think of the legs of a chair or the hinges of a door, or hands, arms, limbs, head, feet, etc. of a character. In addition you can assign different weight values (in the range [ 0.0, 1.0 ] ) to the vertices within a Vertex Group. Hence Vertex Groups are sometimes also named Weight Groups. Many more usage scenarios are possible. 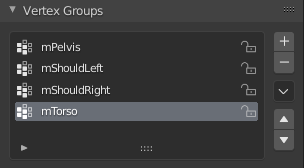 Actually you can use Vertex Groups for whatever makes sense to you. In some contexts Vertex Groups can also be automatically generated (e.g. for rigged objects). However, in this section we will focus on manually created (user-defined) Vertex Groups. Vertex groups only apply to Mesh and Lattice Objects.